Terry Thibodeaux, professor of communication studies, will share his journey “out of the swamps of Louisiana to the academic halls of Texas” on Monday (Nov. 12). The Honors 3332 Journeys seminar presentation will begin at 4 p.m. in the Smith-Hutson Building's Haney Auditorium, in Room 186. “From Out of the Swamps of Louisiana to the Academic Halls of Texas: Not Your Typical Cajun Odyssey” will focus on Thibodeaux’s journey of exploring his roots in the Acadian/Cajun culture and the “calling to spread knowledge of the culture wherever and however I can,” he said. “This has lead me to co-author (the novel) Catherine's Cadeau, write and present several research papers, conduct dozens of interviews of Cajun authorities over a 30-year span, host 10 annual Mardi Gras Festivals on campus, attend two World Acadian Congresses in Canada, host several student field trips to Louisiana for SHSU students to experience the Cajun culture, present several guest lectures across Louisiana and Texas, and other activities,” he said. Born and raised in a large Cajun family in Louisiana, Thibodeaux attended McNeese State University, where he earned his bachelor’s and master’s degrees, and the University of Southern Mississippi, where he earned his doctorate. He taught high school in Louisiana for seven years before moving to Texas to teach at Sam Houston State in 1987. His areas of interest include interpersonal communication, classroom communication and culture. His historical novel Catherine's Cadeau, co-authored by Ann Davidson and published in 2008, chronicles the story of a contemporary Cajun character who time-travels back to 1755 to live through the expulsion of her ancestors from what is now Nova Scotia. For more information, contact course instructor Patrick Lewis at 936.294.3397. Sam Houston State University’s English department will welcome one of its graduates on Friday (Nov. 16) to share his thoughts on 18th century literary studies with anyone interested in literature. Jon Nelson, a doctoral student at Rice University, will present his English Friday Faculty Forum lecture from 3-4 p.m. in Evans Complex Room 212. His presentation will focus on how in the “tremendous reinvigoration” over the last 30 years of 18th century literary studies, “this transformation has obscured the vital influence of the Anglican religion on British modernity.” At Rice, his emphasis is on the areas of 18th century literature and religion. “In 1663, 1664 and 1678 the English Restoration poet Samuel Butler published Hudibras, a burlesque epic about the English Civil Wars longer than Paradise Lost and 10 times the length of The Dunciad Variorum,” Nelson said. “In the centuries following its appearance, Butler's poem has gone from being a work read by the many to one read by the few, a text that speaks only about a kind of religious violence that belongs to the period before modernity. “By examining the revitalized debate in the humanities over secularization, my talk will address how the secularization thesis in its classic formulations has inhibited the interpretation of literary texts such as Hudibras and how recent intellectual developments point toward a renewed understanding of them,” he said. The English Friday Faculty Forum is designed to highlight research by graduate faculty and fellow graduate students. Bringing back an alumnus to present for the forum is a way to show current graduate students the possibilities for further work in the field, said Paul Child, professor of English and forum coordinator. For more information on this, or any upcoming presentations, contact Child at 936.294.1412. The Theta Rho chapter of Phi Beta Sigma Fraternity, Inc., is saying “thanks” to the campus and Huntsville communities for their continued support by offering a free home-style dinner on Monday (Nov. 19). The group’s 15th Annual Thanksgiving Dinner will offer turkey, ham, dressing, green beans, mac and cheese, dinner rolls, an assortment of desserts, and drinks beginning at 6 p.m. in the Lowman Student Center Ballroom. The event is open to the entire SHSU and Huntsville communities, including faculty and staff, said Julian Williams, social chair for the National Pan Hellenic Council at SHSU. In kicking off the season of giving, the Theta Rho chapter requests that every attendee bring one non-perishable canned good or a gently worn article of clothing to the event. Donations will be given to Huntsville’s Good Shepherd Mission in Huntsville. “Something new that they are doing this year is that they’re teaming up with Act One, a performing arts organization on campus, who will be performing an original production entitled ‘The Ensemble,” Williams said. Early arrival is encouraged, but there will be plenty of food and seats for everyone, Williams said. For more information, contact the Theta Rho chapter of Phi Beta Sigma Fraternity at ThetaRho1914@yahoo.com. Four alumni from Sam Houston State University’s Ronald E. McNair Post-Baccalaureate Achievement Program will return to campus on Tuesday (Nov. 13) to answer questions about their experiences and discuss their journeys since graduating. The Student Advising and Mentoring Center’s Grassroots speaker series presentation will begin at 5:30 p.m. in College of Humanities and Social Sciences Building Room 170. The speakers will include SHSU alumni Angie Wilson, Mauricio Rivas, Joanna Tucker and Juanita Garcia. “Without the McNair program I am confident in saying I wouldn't have pursued my educational goals wholeheartedly and with confidence,” said Wilson, who is now an assistant professor in Texas A&M—Commerce’s psychology, counseling, and special education department. “Through the McNair program I developed academic confidence, and I knew that I could complete my long-term goal of attaining a doctorate. The “Grassroots: A Series of Conversations on Leadership in a Diverse Community” was created in April 2003 to promote career aspirations and academic achievements of SHSU’s minority students, according to Bernice Strauss, SAM Center director of academic support programs. The lecture is sponsored by the SAM Center’s academic support programs; the Elliott T. Bowers Honors Program; the International Business Society; the International Hispanic Association; Lambda Theta Alpha Latin Sorority, Inc.; the NAACP; the Ronald E. McNair Postbaccalaureate Achievement Program; Student Success Initiatives Office; and Women United. For associate professor of history Bernadette Pruitt, her journey began with her ancestors and the struggles they endured from slaves to sharecroppers, to blue-collar workers as truck drivers who fled the South as part of the Great Migrations and eventually became auto industry workers in Detroit, to her life in Huntsville. Her “spiritual, emotional and intellectual life journey” as a historian will be the focus on her Honors 3332 Journeys seminar presentation on Monday (Nov. 19), beginning at 4 p.m. in the Smith-Hutson Building's Haney Auditorium, in Room 186. “Celebrating the Sesquicentennial of the Emancipation Proclamation and Remembering a Legacy: A Self Portrait” will share the importance of her genealogy in shaping who she has become, Pruitt said. Pruitt, who went on to become the first African-American woman to earn a doctorate in history at the University of Houston, joined the SHSU faculty in 1996. Her current research and teaching endeavors include black civil-rights, internal migrations and community agency, black urban studies, and race relations and ethnicity in the United States and the African diaspora. Her first book, The Other Great Migration: The Movement of Rural African Americans to Houston, Texas, 1900-1941, will be published in the spring by the Texas A&M University Press, as a tribute to her grandparents. For more information, contact Honors 3332 instructor Patrick Lewis at 936.294.3397. The Sam Houston Association of School Psychologists will showcase school psychology as a field of study on Thursday (Nov. 15). The “What is School Psychology?” informational session will begin at 3:30 p.m. in Lowman Student Center Room 315, during which faculty members from the program will be available during the session to discuss the program and answer questions. SHSU offers a Master of Arts in psychology with a specialization in school psychology. “School psychology is a growing field in today's economy and is a great opportunity for anyone interested in psychology and education As a field, school psychology constantly needs people in the job market and is a field where you can basically choose your job,” said Candice Walker, Sam Houston Association of School Psychologist president. The event is open to anyone interested in pursuing education in the area. Fore more information, contact Walker at cec015@shsu.edu. The SHSU School of Music will highlight string and woodwind professors, as well as its student Wind Ensemble and Symphonic Band with three concerts beginning on Monday (Nov. 12). The Kolenneh Chamber Players will kick off a week filled with musical performances beginning at 7:30 p.m. in the Gaertner Performing Arts Center Recital Hall. The “players” include Javier Pinell, Naomi Gjevre and Zachary Carrettin, violins; Rene Salazar, viola; and Daniel Saenz, cello. On Tuesday (Nov. 13), faculty will get winded with a presentation of “Something Old, Something New, Something Borrowed, Something Blue” beginning at 7:30 p.m. in the GPAC Recital Hall. The chamber recital will feature woodwind faculty members Kathy Daniel, flute; Megan Heuer, oboe; Patricia Card, clarinet; Nathan Koch, bassoon, presenting a new composition, a “standard work” by German composer Karl Goepfart, and a “very lighthearted and entertaining” piece by Gordon Jacob, according to Card. “The first work is a new composition by Bill Douglas which was commissioned by a group of college professors from across the nation. SHSU professor Kathy Daniel helped sponsor this piece,” Card said. “The work which is greatly influenced by jazz and blues harmonies has great audience appeal. Finally, on Thursday (Nov. 15), audiences will get two concerts for the price of one when the SHSU Wind Ensemble and Symphonic Band come together beginning at 7:30 p.m. in the GPAC Concert Hall. The Symphonic Band’s program will include “American Overture for Band” by Jenkins; “Yorkshire Ballad” by Barnes; “Vesuvius” by Ticheli, which will be conducted by graduate associate Ogechi Ukazu; and “Washington Grays” by Grafulla. Afterward, the Wind Ensemble will present “The Black Horse Troop” by Sousa; “Alegria” by Sierra, which will be conducted by graduate associate Cathy Benford; and “Music for Prague 1968” by Husa. Most of the Wind Ensemble's musical selections are being played in preparation for their concert at the Texas Music Educator's Association Convention in February, according to Rachel Denson, graduate conducting associate. The SHSU Bassoon Studio, Phi Mu Alpha music organization, and the Ars Perpetua student composers group will give audiences a few tunes to be thankful for in three concerts beginning on Sunday (Nov. 18). The Bassoon Studio Recital, beginning at 2 p.m. that day in the Gaertner Performing Arts Center Recital Hall, will feature student performers Rachel Denson, Erik Mott, Jenny Yang, Britney Bundick, Emily Cassidy, Brian Kindervater and Jason Pope. They will perform a variety of international musical selections, including “Concertpiece” by Gabriel Pierné, “Concerto in Bb Major” by W.A. Mozart, “Sonata” by François Devienne, “Piéce” by Gabriel Faure, “Adagio” by Ludwig van Beethoven, “Allegro Appassionato” by Camille Saint-Saens, and “Arioso” by Julius Weissenborn. That evening, the brothers of the Zeta Mu chapter of Phi Mu Alpha Sinfonia will perform a range of pieces in ensembles, from a trombone quartet to a full men's chorus, beginning at 7:30 p.m. in the GPAC Concert Hall. This semester's Phi Mu Alpha Musicale will celebrate "Themes for Brotherhood" with a repertoire of pieces that include more than one player. SHSU’s Phi Mu Alpha Sinfonia was founded to create a brotherhood of men that held music to the highest standard possible. “Music is what we express when words are not enough. It is a language everyone can understand,” Laran said. “As musicians, we control the amount of power music has on an individual. As Sinfonians, we strive to give everyone the opportunity to grasp what music can do for them. Finally, on Monday (Nov. 19), Ars Perpetua student composers group will present “an exciting and eclectic collection of fresh new works” by eight student composers, performed by the SHSU New Music Lab, directed by B. P. Herrington as well as by other SHSU music majors, according to Kyle Kindred, co-coordinator of SHSU’s theory and composition program. The program will begin at 6 p.m. in the GPAC Concert Hall. These include works by Kwinton Baylor, Nathan Mays, Thomas Bailey, Steven Scott, Thomas Fedorchik, Inocencio Garcia, Andrei Chelaru and Daniel Vallery. Among the selections will be Mays’s “Àtaremma,” a setting of “The Lord’s Prayer” for three female voices in the fictional Elvish language from the “Lord of the Rings” films; and Bailey’s “Opposition,” a work for flute, clarinet, and two percussionists that “juxtaposes ‘fiery’ wooden sounds and materials with ‘icy’ metallic sounds and materials. Admission is free to all three concerts. 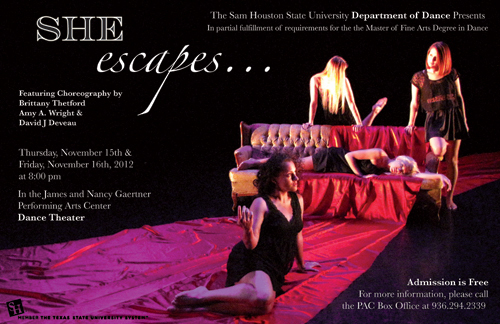 Three graduate students in dance will present “She Escapes”—a range of socially conscious feminist commentary, otherworldly dance theatre and subtle dance based around theatrical light design—on Thursday and Friday (Nov. 15-16) in the James and Nancy Gaertner Performing Arts Center Dance Theatre. The performances, beginning at 8 p.m. on both days, serve as the culmination of research by Brittany Thetford, Amy Wright, and David Deveau to attain their Master of Fine Arts degree. With only the open space and a retro style sofa as the setting, the five solos created by Thetford for her “Kaleidoscope” explore classic female archetypal images with the intent of examining women’s traditional social roles and the way an individual woman’s perspective can break them down and rebuild them anew, according to Wright. “Each solo marries Thetford’s quirky and spontaneously human choreographic style with the essence of the woman performing it to result in a series of vignettes that are at times humorous, absurd, ominous, fresh and canny,” she said. Wright’s “The Passage” offers a glimpse into an unexplored world of fantasy and is designed to allow the audience an escape from their own lives. Finally, Deveau will present the second part of his thesis project, “Fade,” which addresses the collaborative process between a lighting designer and a choreographer in the creation of a new work. Part one of Deveau’s thesis was presented in conjunction with Houston’s NobleMotion Dance in September. For this second work, Deveau hands over the role of lighting designer to Wright so that he himself might take on the role of choreographer. “‘Fade’ is the emotional journey of a woman finding herself at the end of the world left with only the memories of those she loves,” Wright said, adding that feelings of isolation are enhanced by her choice to light the piece with the beam of a single searchlight. For ticket information, call the GPAC Box Office at 936.294.2339. The Student Money Management Center will present effective ways to handle "Holiday Spending on a Merry Little Budget" on Tuesday (Nov. 13). The workshop will be from 3:30-4:20 p.m. in Lowman Student Center Room 315. Led by SMMC peer counselor Samantha McKinley, the workshop will show students how to plan and budget for the season of giving, offering tips for shopping on Black Friday and how to put together an inexpensive gift. McKinley, a junior finance majoring, also will address statistical facts about overspending during the holiday season, ways to plan spending trips, and how to be prepared for any unexpected costs. “We hope to teach students how to give gifts from the heart instead of their wallets,” she said. 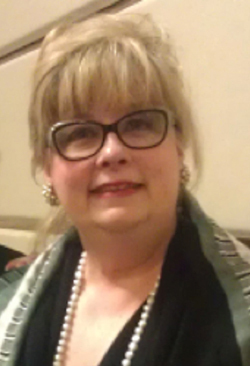 Beverly Irby, associate dean for graduate programs in SHSU’s College of Education and Texas State University System Regents' Professor, was recently awarded the “Information Age Publishing’s Legacy Award” for 2012. Presented by the American Education Research Association’s Research on Women and Education special interest group during its fall meeting in Coeur d'Alene, Idaho, the award honors individuals who have significantly contributed to publishing efforts over time in the arena of research on women and education. Irby is the co-founder and editor of the Advancing Women in Leadership Journal, the first international refereed journal with open access that features research about women in leadership positions around the world. She has published more than 200 papers, books, and book chapters. In 2002, she also co-established, with colleague Janice Koch, professor emerita at Hofstra University, the first book series for Research on Women and Education with Information Age Publishing. Both serve as series editors, whose publications include Defining and Redefining Gender Equity; Gender in the Early Learning Environment; Gender and Schooling in the Early Years; and Women Leaders: Advancing Careers, as well as the forthcoming Women of Color in Academia and Girls and Women in Science, Technology, Engineering, and Mathematics (STEM). “I am honored to be the first recipient of this prestigious legacy award and am happy to represent SHSU in the international publishing arena,” Irby said.